CONSTRUCTIONS: These Collections are multi-dimensional! In other words, they project out from the surface of the wall from 1/4inch to more than an inch. They are constructed by hand cutting paper pieces, or another material such as natural raffia, hand dyed silk ribbon, or glass beads and sewing or glueing them onto the surface of a full sheet of handmade and painted paper. This creates a soft shadow effect and an additional dimension to a wall, enhancing its interest level and perception of depth. All work is hand done in our Whidbey Island Studio. Inspired by the silhouettes of female figures dancing in the moonlight and the sculptures of Constantine Brancusi, the hand cut "figures" are folded and then sewn to full sheets of handmade and hand dyed paper of the same color. Slight air currents in a room cause the "cut-outs" to flutter slightly, giving the wall a vibrancy, shadow movement and a dramatic level of interest. Sword-like Flax leaves are hand cut from hand made paper in the color of your choice. They are then hand folded and stitched for detail and glued randomly to full sheets of hand made, hand colored paper of the same color or a different color of your choice. They may be ordered for either horizontal or vertical installation. These sheets may be combined with plain sheets of the same color for a very tailored and custom installation. Using off-white hand made papers as a base sheet, "snow balls" of the same paper are hand cut and layered 2-3 discs deep, before being glued randomly to the 2" X 30" base sheet. The snow ball discs are glued at the center of each disc, allowing the edges to lift slightly from the surface, and each other, creating rings of shadow. 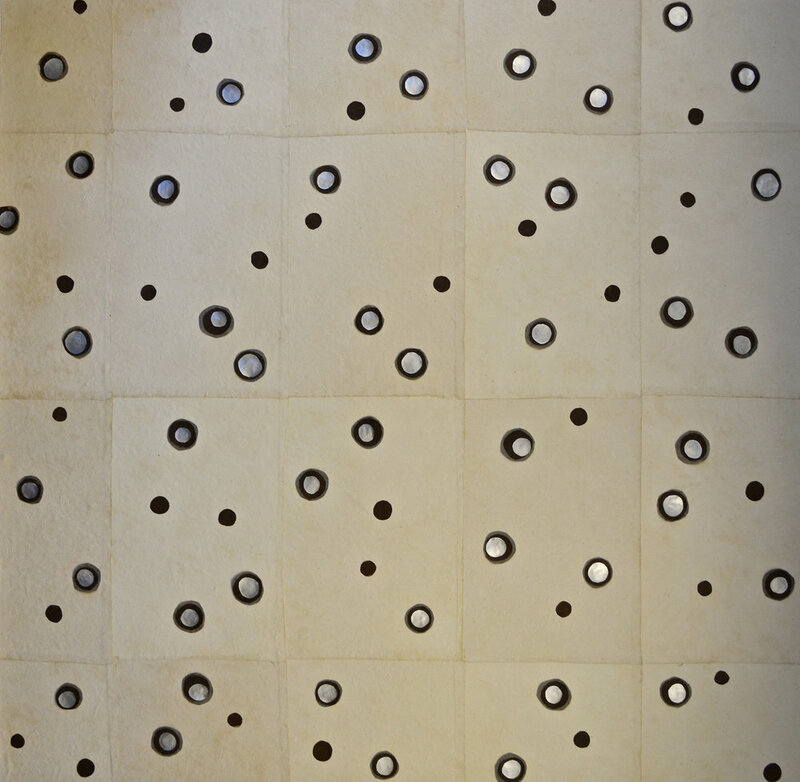 This effect gives the wall surface considerable depth and a sense of subtle movement. Generally there are 3 randomly placed snow ball "stacks" per sheet. See "BUBBLES" for this concept in colors.